This USFL Navy Heather T-shirt features the Los Angeles Express on the front and Young 8 on the back. Our United States Football League T-shirt is an awesome adult t-shirt for any USFL fan. The USFL, United States Football League, was a fantastic football league that played in the spring/summer season and was active from 1983-1987. 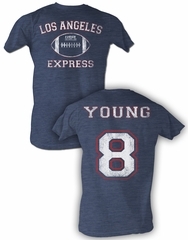 Steve Young was the quarterback for the Los Angeles Express.